This spacious one bedroom, multi-level apartment is centrally located, surrounded by shops and restaurantss. 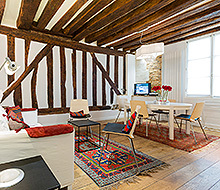 And it is nestled in a small building that has kept its charm over the centuries with a wooden staircase and exposed beams. A first floor walkup, the apartment has an open floor plan and ultra modern styling. The kitchen is sleek with black and white details and is fully equipped. At the long white dining table, seat six and enjoy the architectural elements of the room: original wooden ceiling beams, accent lighting, and a bright orange railing for contrast and flair. This room also offers a white leather couch and other artistic touches. A few steps to the upper level is the central living area. A white leather couch converts to a sofa bed and sits across from a large screen television and small office space. Windows facing the street provide lots of light while the double panes keep out the sounds of this popular area. The dark curtains and adjustable partition give this room a bit of privacy and separate it from the kitchen and dining areas. A few steps to the lower level is the bedroom with a queen-size bed, two full closets, and a recessed office space with desk. Enjoy the Paris skyline above your bed and the modern décor of this room. Blackout shades block the sunlight from the windows that brighten the apartment during the day. The bathroom continues the ultra modern look of the apartment with its square washbasin and tiled shower. Detached WC. The apartment is totally renovated and has all modern appliances and bathroom fixtures. 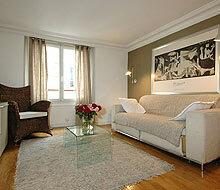 You couldn't ask for a better location than the St Germain des Arts apartment. It is a block from the Metro and easy walking distance to so many sights, as well as close to great restaurants and shopping. The location has some drawbacks, however, as the nightlife can go long and loud making it a bit challenging to get a good night's sleep. Once you get used to it, though, it is manageable, particularly if you don't make any early plans so that you can sleep in with the neighborhood. The apartment was so comfortable, bright and clean. The location was great for us as we did not know Paris and it was central to everything. Our greeter was very nice and helpful. Everyone we dealt with through email was very responsive. The only problem we saw was something we handled without too much trouble, but the location is noisy at night. 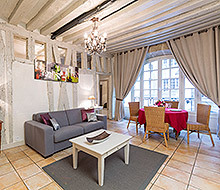 The location of the St Germain des Arts apartment was perfect. It was one flight on stairs up. We could not have been happier! 2 blocks from Notre Dame Cathedral. Who could ask for anything more. It was easy to get to the Metro and use the bus system. We would stay there again! Merci Beaucoup! We loved this apartment! It was clean and had all the amenities we needed. Plenty of towels and comfortable bedding were prepared for us. The location is unbeatable for being next to the St. Michel metro station and various bus stops. We also walked to many sights. The St. Germain neighborhood is just lovely. Bakeries, cafes, shopping, and gorgeous architecture are steps away from this apartment. Franck was so gracious and helpful in setting up the rental and answering all questions. Eleanor greeted us upon arrival and was easy to contact by text throughout our stay. We felt that the Paris For Rent team genuinely cared for us! Thank you for being instrumental in our beautiful week in Paris!